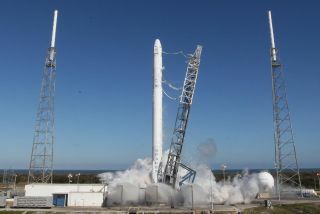 SpaceX's launch of a cargo resupply mission to the International Space Station has been delayed from Sunday after a critical U.S. Air Force rocket tracking radar was knocked offline, officials said late Wednesday (March 26). The radar is part of the Air Force-run Eastern Range, a network of tracking, communications and safety assets stretching from Florida into the Atlantic Ocean. Sources said Air Force officials are trying to repair the radar after a fire damaged it. The radar is located near Cape Canaveral, but an Air Force spokesperson did not respond to multiple inquiries on the nature of the problem and how long it would take to fix. Engineers will return the Atlas 5 rocket to its nearby integration building Thursday to wait for another launch attempt. A new target launch date for SpaceX's Falcon 9 rocket was not available late Wednesday, but a company spokesperson confirmed Air Force would be unable to support a launch attempt Sunday night. Engineers had analyzed differences between the Atlas 5 and Falcon 9 rocket, including the configurations of the launch pads and the speed at which the launchers take off, to see if the boosters could fly without the damaged radar, a source said. The SpaceX cargo resupply flight to the space station must be scheduled around other visiting vehicles. A Russian Progress cargo spacecraft is set to launch and dock to the space station April 9, so any delay of more than a few days will likely cause the SpaceX launch to slip to mid-April, at the earliest. The Falcon 9 launch was previously delayed from March 16 to review contamination on thermal blankets inside the Dragon spacecraft's unpressurized cargo bay. SpaceX says the review showed the blankets were acceptable to fly without changes. The Dragon spacecraft will deliver 2.4 tons of equipment to the space station. Most of the payloads are packed inside the Dragon's pressurized cabin, including 1,576 lbs. of science and research equipment, 1,049 lbs. of crew supplies, 449 lbs. of vehicle hardware, and 271 lbs. of spacewalk tools. The space station crew will unload the gear inside the Dragon spacecraft's internal module. Two larger payload packages inside the Dragon's unpressurized section will be removed and stowed on the space station using the outpost's Canadian robotic arm and Dextre robot. The optical communications and high-definition video systems carried inside the Dragon's external trunk are the first large unpressurized NASA experiments assigned for delivery to the space station by SpaceX. The Dragon spacecraft is expected to remain attached to the space station for about one month. The cargo delivery mission is SpaceX's third operational resupply flight under a $1.6 billion contract with NASA covering 12 missions through 2016. You can follow SpaceX's launch preparations for Dragon and the Falcon 9 rocket on Spaceflight Now's Mission Status Center. Follow Stephen Clark on Twitter: @StephenClark1. You can follow Spaceflight Now on Twitter @SpaceflightNow and on Facebook. Copyright 2013 SpaceflightNow.com, all rights reserved.